If you’re not saving enough for retirement, you could be among the 42 percent of Americans who will retire broke. Retirement savings of $1 million could go far, if you live in the right state. You can avoid relying on Social Security benefits and still enjoy a comfortable retirement if you make some lifestyle changes now. Retiring early has always been a dream of mine, and until recently, I didn’t think it would be possible. What if I told you I plan on retiring without depending on a single dime from Social Security? Do I have your attention? First, a little background information is in order. Social Security was intended to supplement retirement income, yet nearly 45 percent of retirees rely almost exclusively on Social Security as their only source of income, according to a GOBankingRates survey. Whether you plan on collecting Social Security, having a clear plan for funding retirement expenses is critical. To determine how far the typical Social Security benefit will go, GOBankingRates evaluated all 50 states by analyzing costs for groceries, healthcare, transportation and utilities. According to the study, Social Security will cover only 43 percent of monthly living expenses for the typical 65 year old retiree in my home state of Arizona. 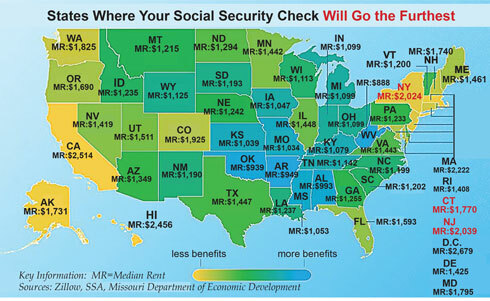 The average Social Security check can cover rent in only 26 states, and in high cost areas like California, Hawaii and Washington, D.C., your check covers less than half the rent. If you want to get the most out of your Social Security check, consider moving to a lower cost of living state in the South or southern Midwest. To make things worse, unless Congress acts, Social Security trust funds will not have sufficient funds to pay full benefits to retirees starting in 2035. Couple that with budget deficits projected to top $1 trillion by 2020, and I have serious doubts about whether I will receive my entire benefit when I decide to apply for Social Security. For these reasons, I chose not to include Social Security in my retirement plan. Here’s how I plan to accomplish my goal. I didn’t know it at the time, but I have been preparing for retirement since my early 20s. As soon as I was hired right out of college, I enrolled in my employer’s 401k savings program, as did my ex-wife. By selecting a diversified mix of low cost index funds and increasing our monthly contributions as our incomes grew, we were able to take advantage of tax deferred compounding to build a substantial retirement savings fund. Early retirement would not be an option today if we had not started investing when we did. For me to be able to retire without depending on Social Security, I knew that I had to have multiple sources of income that I could rely on during retirement. I am fortunate that one of the benefits of being a teacher in the state of Arizona is that I qualify for a pension that will provide 73 percent of my income. I have been contributing a portion of my monthly pay — currently, 11.5 percent — since I began my teaching career 22 years ago. Because I won’t be paying into Social Security (7.65 percent) or my pension (11.5 percent) when I retire, I only need to generate an additional 8 percent of my pre-retirement income to maintain my current lifestyle. Other income from my rental property, blog and web businesses, and retirement savings will allow me to retire at the age of 60 with 100 percent of my pre-retirement income. I have always equated frugality with being intentional with my purchases. Living within our means has allowed my girlfriend and me to enjoy life together without the burden of adding debt to finance our lifestyle. The only debt we have is the mortgage on the rental property and a small balance on a zero interest credit card account. I am also proud to say that I own a 2001 Ford F-150 that is still going strong thanks to a little TLC and some elbow grease by yours truly. I can afford to drive a new vehicle, but I choose to keep the F-150 on the road. At some point, it will make financial sense to buy a used vehicle, but for now I’m just fine putting that money in a savings account. Another way we save money around the house is by tackling DIY home improvement projects ourselves. We have saved thousands of dollars over the last few years by installing wood laminate flooring and painting the interior of our home instead of hiring a contractor to do the work. Your local home improvement center is a great place to pick up some DIY skills by taking a class in laying tile or installing new kitchen cabinet hardware. Not only will you have fun doing the work yourself, but you will also be adding to the value of your home. Through diligent saving and creating multiple income streams, I have peace of mind knowing that I am on track to retire early and have the funds to do the things I love such as traveling, taking painting lessons and playing golf. GOBankingRates is a personal finance resource designed to make learning about money and managing your finances more fun and less intimidating.